The relays are monitoring the setpoint values and are signalising the over- or underexceedence of the preset values. Depending on the version the units have one or two changeover contacts. The monitoring relays are mounted on a 35mm DIN rail. Analogue one- or triphase AC voltage monitor with neutral. Signalises overvoltage, undervoltage, phase loss, phase asymmetry and phase sequence. Digital one- or triphase AC voltage monitor with or without neutral. Signalises overvoltage, undervoltage, overfrequency, underfrequency, phase loss, phase asymmetry and phase sequence. Monitors a 3-phase voltage without neutral. The device monitors the phase availability, correct phase sequence (U,V,W) and the phase voltage. 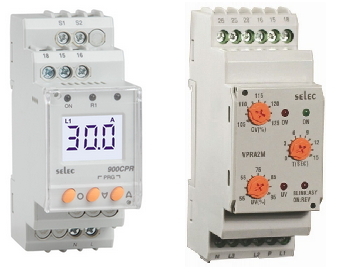 Digital single phase AC current monitoring relay. Monitors over- and uncercurrent, up to 5A direct connection, over 5A connection with external current transformer. 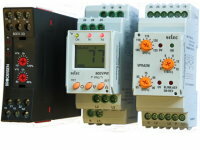 Digital three phase AC current monitoring relay. Monitors over- uncercurrent and asymmetry, up to 5A direct connection, over 5A connection with external current transformers.